Another one of those. Atma Xplorer is doing good so far, having an Alexa rank of 89,064 isn’t so bad right? But right now, I’m feeling the crunch of having to think under the banner of this blog rather than simply posting spreading out of it’s interests. Hence, a minor change. I’m migrating most of the regular gaming news to my new blog, Game Xao and shifting this blog’s focus onto another hobby that I’m slowly growing my sleeve into, digital photography. Sure sure, I’m not that great nor am I really that active in pursuing it (financial barrier here) but I feel that adding a photography section to Atma Xplorer is the right thing to do right about now. You’ll still get your dose of PSP-related stuff as well as other juicy tidbits from the game world so the shift is really a minor one. 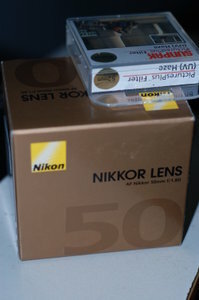 To anyone interested, my gear is composed of a D40 Kit and a Nikkor 50mm Lens (shown in the inset). I don’t have much of a portfolio at the moment but you can view SOME of the shots I’ve taken via my flickr account. You can also watch my new Deviant Art account. If you’re interested in Technology News, you can also visit my technology blog at Pinoy Tech Guy and if you’re simply looking for a place to crash with Japaholics (Anime fans, Cosplay fans, etc), head over to Ichiraku. Sounds good to me. I look forward to your photography posts. Also for future psp posts etc, I like when you talk about the game from your perspective rather than just outlining what it is. It’s more of a personal touch. e.g. You talked about how you play MH at a cafe every Saturday morning. It’s much more interesting that way. Hehe.. I’m actually looking where to start with photography. Also on gaming, I do wish I could get back on it. Too little time on my hands to draft up and polish up a post.